Phil qualified from the Royal Veterinary College, London in 1974. 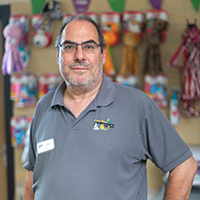 He likes to keep up-to-date with new advances in veterinary treatments embracing innovations in the industry as they come to light. He is a very experienced small animal clinician with a particular interest in skin problems and reconstructive surgery. Phil lives locally with his wife, two sons, Jack Russell Terrier called Winnie and two cats called Amber and Poppy. Out of work he enjoys taking his sons to play football and cricket, spending time with his family and watching a good film.